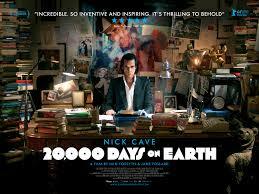 This evening I watched 20,000 Days On Earth. One would be forgiven for thinking that it might be a sequel to 20,000 Leagues Under the Sea, but it's a biopic of Aussie-born, now Brighton-resident singer and writer Nick Cave. Released late last year, it was directed by Jane Pollard and Iain Forsyth, their first film after meeting each other at Goldsmiths College. And they've done a very good job. Stylish and beautifully shot, it somehow comes across more as a piece of fiction than documentary. Cave wakes up beside his real wife, goes to see a real shrink, and an unprepossessing Kylie Minogue, chubby Blixa Bargeld and actor Ray Winstone appear as chatting passengers in his car as he drives around Brighton… but they all seem to be following a script (reinforced by the presence of Winstone). A short, touching scene shows Cave on the sofa, watching TV & eating pizza with his two sons, made terribly poignant through the knowledge that in real life just a few weeks ago Arthur fell to his death from a cliff not far from his home. I really liked Cave in the 80s - particularly The Birthday Party, the first Bad Seeds album in '84 (I saw them a couple of times) and his debut novel - but I lost some interest beyond that. So ultimately, because I'm not nowadays a fan, I couldn't really warm to what was in effect his 20,001st day on planet Earth, a fair part of which was working on his new album. But Pollard and Forsyth are directors to keep an eye on.